Welcome to North Coast Creations November Release! 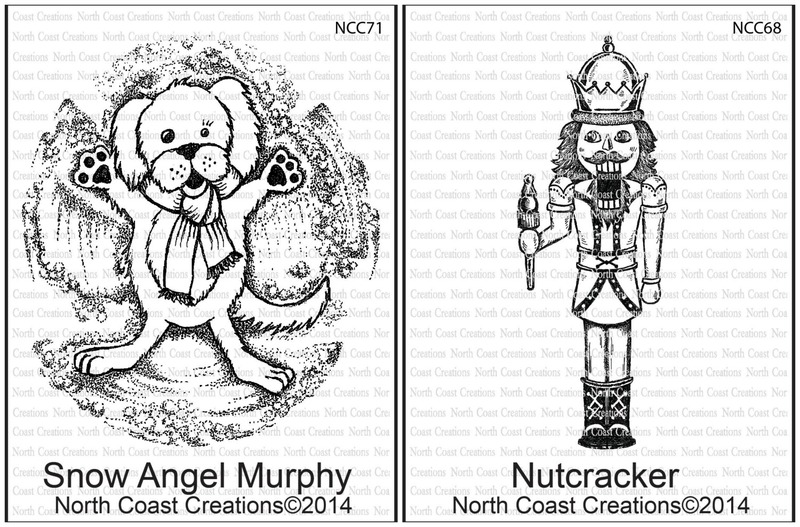 This month, North Coast Creations is releasing two Christmas stamps, Snow Angel Murphy and Nutcracker. Continue reading below to find out how you can win one of two North Coast Creations $10 Gift Certificates good towards the purchase of NCC Stamps. 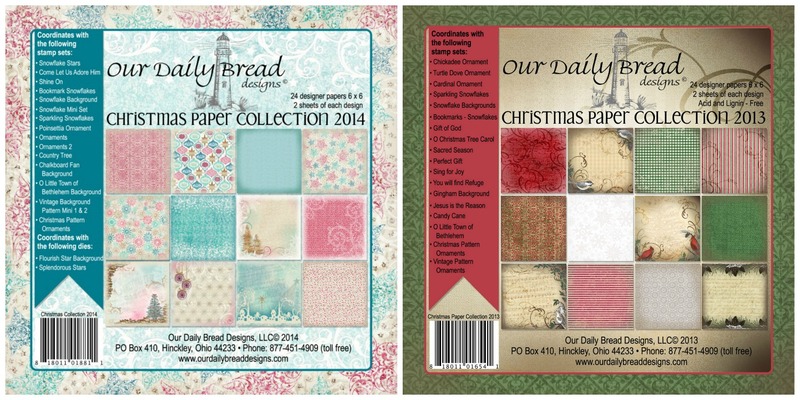 I'm sharing cards created using both of the November release stamps along with Pattern Paper and Custom Dies from Our Daily Bread Designs, NCC's Sister Company. My first card uses Snow Angel Murphy, Santa's List (hat) and Santa Paws (sentiment) stamp sets along with Our Daily Bread Designs Christmas Paper Collection 2014, Custom Matting Circles Dies and Custom Circle Ornaments Dies. After die cutting the pattern paper from the Christmas Paper Collection, I matted it on Gold card stock, then the Soft Sky base card. I stamped Snow Angel Murphy in Coffee Archival ink on Kraft and Vanilla card stocks and also on scraps of the pattern paper, cutting the pieces as shown, sponging the edges before adhering them. I also stamped the "hat" from Santa's List on a scrap of the pattern paper, it fits Murphy just right! I used the ODBD Custom Circle Ornaments Die to cut the pattern paper, layering it on the Gold panel that was die cut using the ODBD Custom Matting Circles Dies. I used the omitting technique to stamp the sentiment from the Santa Paws stamp set on a scrap of the pattern paper, mounting it on Gold card stock and adhered to the card using dimensionals. My second card uses the Nutcracker stamp along with Our Daily Bread Designs Christmas Paper Collection 2013, ODBD Custom Vintage Flourish Pattern Dies, ODBD Custom Vintage Labels Dies and ODBD Custom Flourished Star Pattern Die. I created an SVG File for the Nutcracker, and cut the file from White card stock using the Silhouette, then used a SAMJ to stamp the image in Black Archival. I added color to the image using STAEDTLER Watercolor Markers, sponged the edges with Ranger Gathered Twigs Distress ink, then adhered the image to the Christmas Paper that was die cut using one of the dies from the Vintage Flourish Pattern Die, adhering it to the Black panel that was die cut using the Vintage Labels Die. The large Black panel was die cut using the Flourished Star Pattern Die. Two randomly selected winners will each receive a $10 gift certificate to North Coast Creations, good towards the purchase of NCC stamps, just for commenting on the Design Team cards! You have until November 24, 2014 at 10:00 PM EST to leave a comments on the participating designers blogs for a chance to win! Winners will be posted November 25th, on the North Coast Creations Blog, so be sure to check back there to see if you are one of the winners! Hey Lisa!!! Your cards are so cute! Great designs and coloring! So cute, Lisa! Terrific colors and papers and a fun layout on the Murphy card. Murphy is pretty clever doing the snow angel thingie. Cute card. Your snow angel is darling. how cute, Lis! 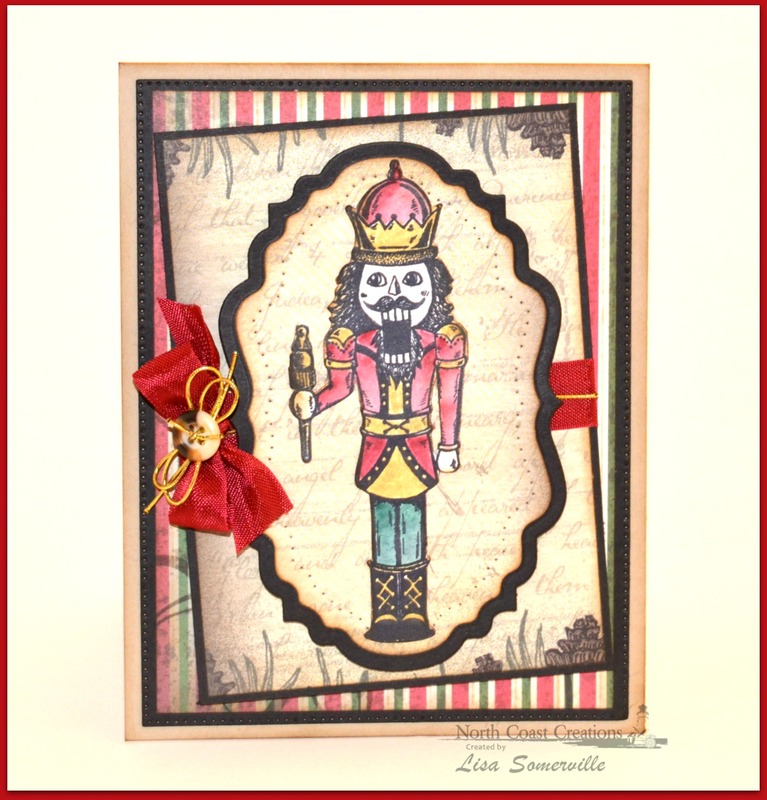 love the Nutcracker design! Love the Murphy card. Its so cute! !